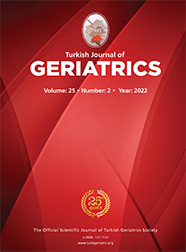 CAN FOOT PAIN AND MUSCULOSKELETAL DISORDERS BE COUNTED AS RISK FACTORS FOR FALLS IN THE ELDERLY? BURNOUT AND RELEVANT FACTORS IN NURSING STAFF: WHAT AFFECTS THE STAFF WORKING IN AN ELDERLY NURSING HOME? CAN POOR SELF-RATED HEALTH PREDICT CORONARY HEART DISEASE (CHD) AND MORTALITY IN THE ELDERLY PEOPLE?